I have spotted a bunch of great movie deals lately, and Walmart is no exception. Select children’s movies are priced at $5.00, $7.50 or $9.96. Some older titles are even as low as $3. There are several popular titles for $5 including Ice Age, Epic and more. 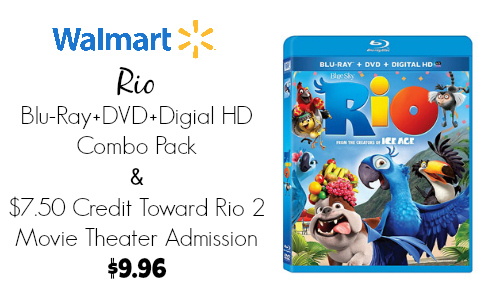 You can get a $7.50 toward movie admission to see Rio 2 when you buy Rio on Blu-Ray + DVD + Digital HD Combo too! These would make for some great gifts or a fun family movie night, so be sure ti check it out! Offer valid for a limited time. Choose in-store pick up to avoid shipping charges.